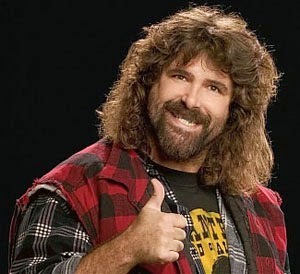 One of my favorite American professional wrestlers is Mick Foley, aka Cactus Jack, aka Mankind. In his first book, titled “Have a Nice Day: A Tale of Blood and Sweatsocks” (which was a New York Times best seller! ), he talked about wrestling being “fake”. In essence, it is fake, in that outcomes are predetermined, and they’re not actually out to harm each other. The wrestlers plan their moves, and communicate throughout the match to make sure that the action flows towards a logical conclusion. Of course, the reality is that jumping off of steel cages onto the Spanish announcer’s table 20 feet below does take its toll on the body. The physical abuse is not fake. But I digress…. I think the same idea can apply to modeling. Generally, all modelers are in some way striving to make their work appear like the real thing, or in some cases, look like a real thing (as in scifi, etc.). Even when the methods of interpretation vary, the goal is the same. The modeller wants to “sell” the idea that the object being viewed has a genuine quality to it, that it is the real thing. Now, making a small-scale object appear to look exactly as the 1/1 object does is difficult. The viewer knows it’s a small, plastic (or resin, or whatever) object. They know it is not the real thing. So we use various techniques that invite the viewer to suspend their disbelief that what they are seeing is actually just a plastic toy. And just like wrestlers have different styles and approaches, so do modelers. Some are more over the top, some are more subtle. But the goal of any style or technique is to “invite” the viewer into the world of the object, and in some way, experience it as if it were the real thing. Is it always realistic? Well, none of it is, really, in the very strictest sense. The realities of part molding, paint application, scale, light, and so many other factors mean that any efforts we put forth are simply attempts at realism, based on how the creator of the model sees things at the time, and how they want their audience to perceive the final result. One person may look at it and say “that’s not realistic at all”, while another looks and says “wow – that is awesome!” In a strict sense, both are right – and wrong – at the same time. What is the old saying – “beauty is in the eye of the beholder?” I suppose the same could be said for realism. Still, I’ve always wondered what it would look like if you could go back in time, take a real World War II airplane for example, hit it with a shrink ray, and size it down to 1/48, 1/32, or whatever scale, and sit it on a table at a show. I am quite certain that some folks would love it, and others would not. Another great article. I usually build 1/87 truck models. That being said I instead of recreating a certain company or historical model of a company no longer around, I take the approach of “What if?” in my models. Now as we all know 1/87 is pretty dang small, so making it look “real” is kinda hard most times. But with the invent of digital cameras and editing software it is easier. Now because I also have been involved with model railroading over the years I have been blessed with reading and learning from some great builders over the years. I remember reading a few articles back in the old days about Detail vs Illusion modeling. As it says detail modeling require every detail on the original to be present. This can lead to funny jackets with real long sleeves, medication and stays at places we will not talk bout, and eventually there is drooling involved. (shudders) Now illusion modeling is different but meant to make it look like you would see it in the real world, without the need for meds. I have used an approach that seems to help with the illusion. I watch people look at the truck or model, and when they put up closer to their eye or get down to look closer I note where they are in distance from the model, and then do a scale measurement, and make note of it. Then when I shoot pictures of the real truck I take close up for reference, and then at the distance I have noted from watching people. For example I noted that on average most people who try to get up close and personal with my models end up being 30-40 scale feet away, so I take my second set of pictures from that distance from the prototype. Now I have reference shots nd see what needs to be duplicated and what can be illusion ed. It also comes in handy when doing photos of said trucks as I can then create the iullusion and people at first think it is real. Interesting approach – very cool!